...... 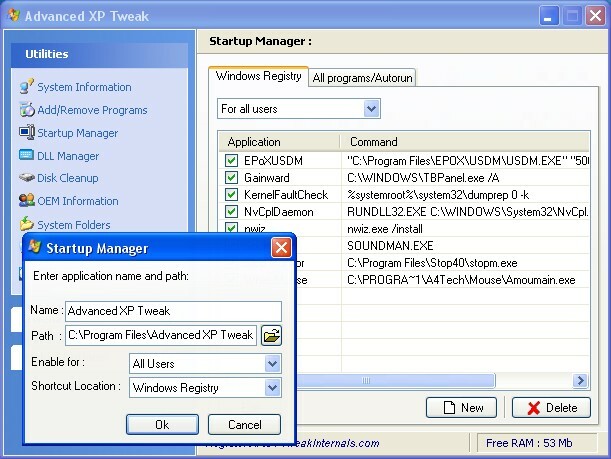 It is the best way to tweak and optimize your Windows XP system. Advanced XP Tweak gives your system the look you want, and optimizes its performance for the tasks you do most often, while cutting CPU and RAM expenses on the tasks you are unlikely to perform. * As well as plenty of other useful tweaks. Fine-tune, optimize and speedup your Windows XP system & IE easily and safely. Advanced Data Export will save your data in the most popular data formats. Qweas is providing links to Advanced XP Tweak 2.52.272 as a courtesy, and makes no representations regarding Advanced XP Tweak or any other applications or any information related thereto. Any questions, complaints or claims regarding this application Advanced XP Tweak 2.52.272 must be directed to the appropriate software vendor. You may click the publisher link of Advanced XP Tweak on the top of this page to get more details about the vendor.